Female threaded bonding fasteners are available in a variety of insert diameter, collar length and base plate combinations, with both ‘blind’ (a closed base plate) or ‘sighted’ (a base with a central through hole) versions offered as standard. 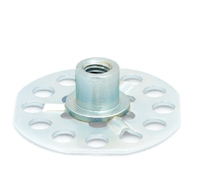 This female bush design is often used for moulding into or surface bonding to GRP, fibreglass, carbon fibre and other substrates and the perforations in the base plate allow this by letting adhesive or resin to lock the fastener onto the substrate, spreading the load when a load is put on it at final assembly. Please note that this information is for guidance only and you are advised to contact us to determine if a particular combination of fastener and base plate is within our standard range and in stock. All items are manufactured in Mild Steel (MS) or 316 Stainless Steel (SS). We offer an unbeatable long-term, low price guarantee. Contact us now to find out more. We also supply a variety of accessories which we recommend for use with our bonding fasteners, including 400ml and 50ml methacrylate adhesives, a range of male thread protectors, spring clips, nuts and washers. Contact us to find out more. Our quality management system is at the heart of our business and we are fully committed to a system of continuous improvement. Since our formation back in 1999 we have pledged to provide as professional a service as possible to all customers, regardless of their size or order history. Veck Composite Fasteners Ltd continues to lead the way in providing the highest quality through our ISO 9001:2015 certification, alongside a fast delivery service and low price guarantee. Please contact us now with your enquiry, for an immediate quotation or to otherwise confirm the price & availability of any of our bonding fasteners. We stock many other fasteners which are similar to items in our standard range and may not be listed in our product catalogue. If in doubt, please contact us.